As a rule, both unfortunate and challenging, I don’t eat traditional bread or pasta. This was a difficult dietary transition and I would call myself more of a reluctant gluten-avoider than gluten-free. I avoid these things because I don’t feel all that well when I eat them, but I do eyeball fabulous looking pastries and muffins every now and again and sigh, wistfully. I have had a hard time finding delicious gluten-free muffins that don’t weigh ten pounds and get stuck in your throat when you try to swallow them, despite several unsuccessful attempts at baking them myself and investing in countless types of exotic flours. Avoiding gluten requires stealth and, quite frankly, can be a bit of a rabbit hole. I came across this recipe, and not only was it easy to make, it required just one type of flour – almond meal – a gigantic hallelujah. I love sharing good recipes I find that are healthy and delicious. My kids and friends love them (always a good sign), and I hope you do too. Preheat oven to 325 degrees. Oil, or line muffin tin. In a large bowl, mix together almond meal, bakind soda, salt, cinnamon, and coconut. In another bowl, whisk together eggs, bananas, butter, honey and vinegar. Combine the wet ingredients into the dry ones. Lightly fold in dates, carrots and walnuts. Divide batter among the muffin cups. Bake 35-40 minutes, or until a skewer comes out clean. The muffins do not rise much, so the cups can be filled quite high. 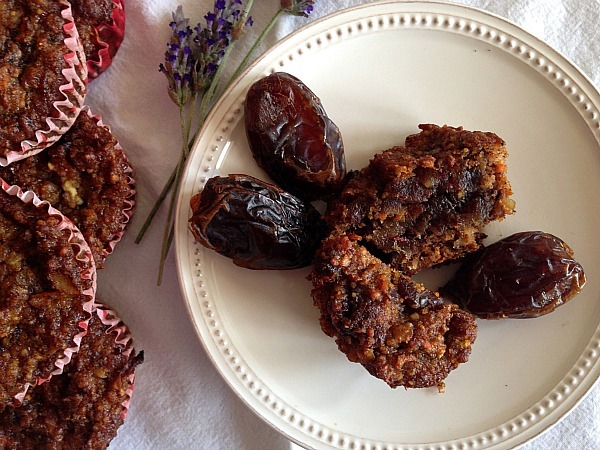 I highly recommend using Medjool dates -they are big and juicy, creating pockets of sweet deliciousness in the muffins. I think you will love them! Let me know.